It was a long way from Budapest to Belgrade, so we had decided to take the motorway. I had ridden most of that road on my way to Romania, and since it was about 500km to Ighiu and I wanted to take mountain roads once on the Romanian side, I had also taken the motorway and paid for a matrika, the vignette that allows you to use it. As this time we were trying to save as much money as possible, I decided to risk it and not pay for it. In any case, we had come all the way across Poland and the northern part of Hungary without getting one and nobody had stopped us (motorbikes were exempt from road tax in Slovakia). The ride to the border was quick and uneventful, at a point there were a few drops of rain, but seeing that it was sunny ahead I did not stop to put the rain gear on, and in a couple of hours we were at the border. I had crossed 9 borders without stopping since leaving Russia and was getting used to the convenience of travelling within the EU, so I had almost forgotten the hassle of waiting for your passport and the bike’s documents to be checked while sitting in the sun in full riding gear. 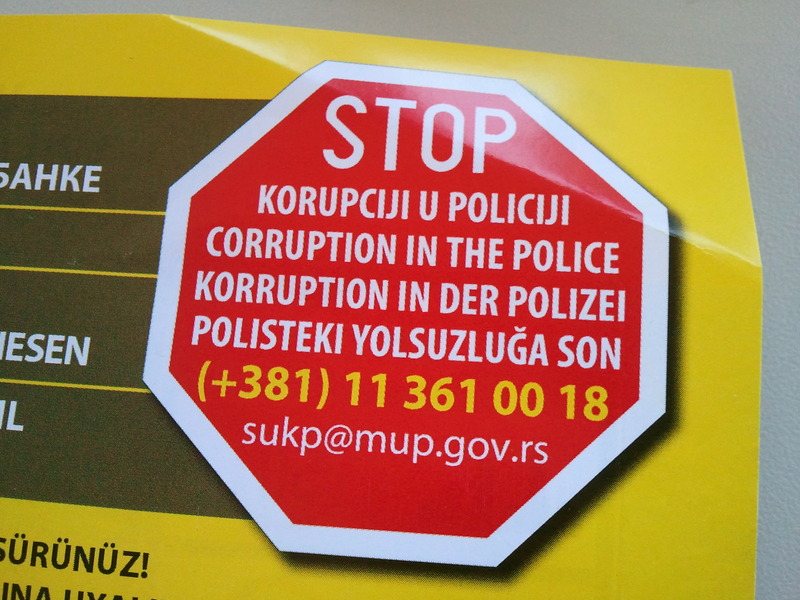 Fortunately, it did not take long, and we were handed back the stamped passports and a leaflet warning about police corruption with a hotline number to call in case we were stopped and had problems with the local police. Nice welcome. I had learned to trust first impressions when crossing into a new country based on lots of factors – landscape, border guards, drivers’ behavior, and gut feeling in general, and I got the impression that Serbia was a country that I was not going to enjoy much. We stopped for petrol and a couple of coffees at the first service station we found, and a man driving a BMW came over to say hello. He was from Liverpool, and was travelling to Bulgaria for the holiday with his wife, who was from there, and his mother-in-law. He was very enthusiastic about our trip and wished us the best of luck. For most of the ride to Belgrade, the landscape were flat, dull, sun-scorched fields, and the boredom was only momentarily broken by the occasional bit of road under maintenance. We stopped for one last break in another service station, where I bought a country sticker and had a chat with three boys who worked there, who also asked about the trip and said half jokingly half seriously that it would not be a good idea to visit Bosnia and Herzegovina and Croatia with a Serbian sticker on the bike. By the time we got to Belgrade the sun was a dull shade of gray, and it was unbearably hot, which did not help much with the first impression I got from the city. Things got a lot worse when, right after crossing a bridge over the Danube, the GPS said that we were only a few meters from the hostel. We were on a five-lane street, three lanes going up and two going down, with very narrow sidewalks, lined with tall buildings covered in thick dark grey soot from the traffic fumes, with absolutely nowhere to stop and no way of taking a U-turn to reach the hostel front door, which was on the opposite side of the street. The only thing I could do was to ride on and look for a place to turn around. If you are planning to visit Belgrade by car or motorbike, don’t. Seriously. It is much worse than anything I saw in Russia or Ukraine. At least there, you could get around the traffic and pretty much do anything you needed to do to get to your destination – U-turns, riding on the pavement, parking anywhere – but Belgrade was full of traffic, there were traffic cops everywhere handing out fines to drivers who stopped anywhere that was not allowed, and it was not allowed virtually everywhere in the center. To make matters worse, there was no logic at all to the streets layout, and it was impossible to navigate your way back to a certain point once you had ridden past it, everything was no way, no turning, no stopping, no parking, no entrance, pedestrian area, dead ends… It was a nightmare. It took us a very long time to find a way to get back to the hostel street the right way, and when we managed to do it, I just put the motorbike on the pavement, effectively blocking people’s way and only inches away from speeding buses. Nat when to check we had got the correct address – in true Soviet style, there was no sign anywhere indicating there was a hostel there – and I prayed that no cop would decide to fine me in the meantime. She came back with bad news – there was nowhere to park the motorbike nearby. There was a shopping center, but it was on the other side of the river, and the girl at reception had no idea whether we could leave the bike there overnight. Hot, irritated and tired, I unloaded the bike while the buses charged down the street and then programmed the GPS to find the nearest car park. At that point I did not care how much it might cost to leave the bike there for the night. It indicated that there was one on the street just behind the building, but it took me a long time again to find a way to access that street. I finally made it to a multi-storey car park which did not seem to have much in the way of surveillance, made sure everything lockable was locked and chained it to a column. I got back to the hostel sweaty, tired, and with a deep dislike for the city. After a cold shower we went out for the rest of the afternoon and evening to visit the city, but I came to the conclusion that it had nothing to offer that justified the misery of riding or driving into it. And that is the first time on this trip I have felt this way. 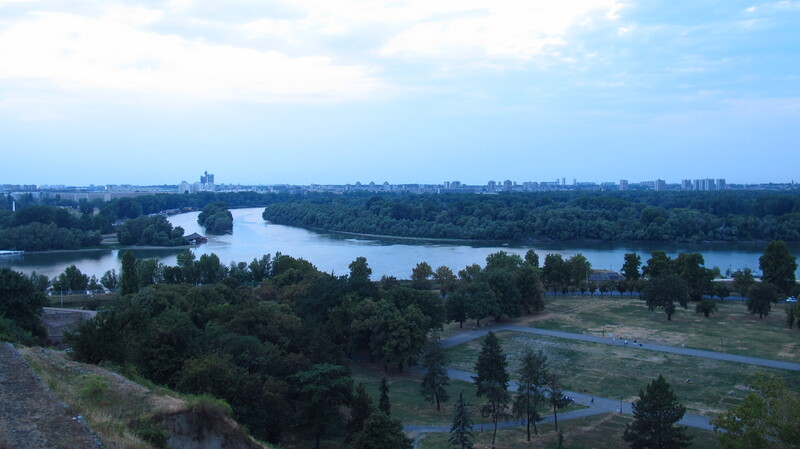 This entry was posted in Stroming The World 2013, Travel and tagged Belgrade, Serbia, STW 2013 by Kilian. Bookmark the permalink.